I've reached 500 000 clicks! 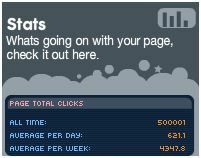 I just reached a half million of clicks. Re: I've reached 500 000 clicks! WOW! Amazing to reach that many! Congratulations. Congrats! I'm no where near that. Congrats so much!!! I don't even have a tenth of that. woah! congrats! I only have 21,000. Wow. I think I have maybe 10,000. Congratulations Zim! I mean, Sim. Congrats, now go for a million! I propose that we each give at least 10 clicks to Sim a day in order to help him get to a million. Wow! That's amazing Sim! Congrats!! Wow, congrats, Sim! When do you think you'll get to a million? At the end of the year maybe. LOL. That couldn't be. It would be at last end of 2011. Well, 1,000,000 IS a lot. Congrats to you - that's an amazing achievement. My stats are already much further after almost 3 months. Congratulations man! And, as they say in basketball, and one! Get it? Because you had 500,001?!? Get it? *makes horrible jokes* But seriously, nice job man! Congratulations sim! I encourage you to keep up the fantastic work. That beats my measly 10,000. You guys do realize that I necrobumped this, and that Sim posted this in March?